In 1906, the Raleigh and Pamlico Sound Railroad Company decided to bring the railroad through the Whitley and Horton family farms in western Wake County. Edgar B. Barbee and Falconer B. Arendell organized the Zebulon Company for development that same year. The company received its charter on February 15, 1906. Shortly thereafter, they began to divide up their forty-nine acres into lots, blocks, streets and avenues. 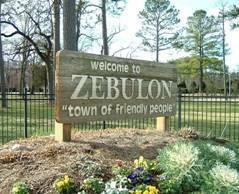 On February 16, 1907 the town was officially recognized as Zebulon, North Carolina. The town was named after Zebulon Baird Vance, the Governor of North Carolina during the American Civil War. The first election was held in May 1907 and the first elected mayor was Thomas J. Horton. Ninety years after its incorporation, Zebulon annexed the neighbor community of Wakefield. This most recent annexation, which took place on December 31, 1997, increased the total acreage inside the corporate limits to 2,115 acres and the population to 3,908. In the year 2000, the population has grown to 4,046. There are three properties in Zebulon listed on the National Register of Historic Places: Wakelon School, Bennett Bunn Plantation, and the George and Neva Barbee House.